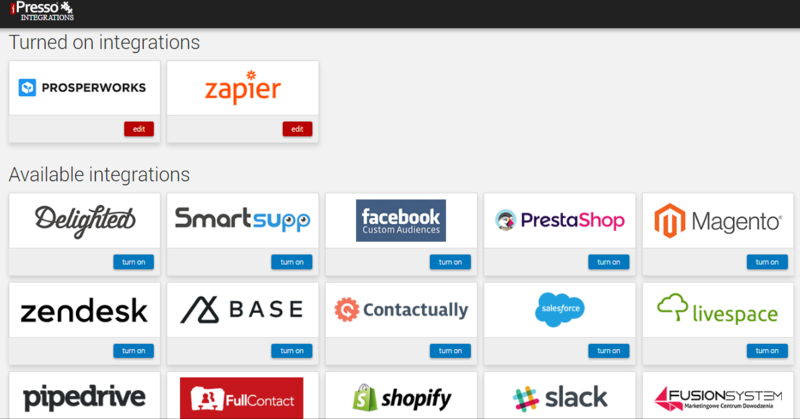 iPresso’s New Integration Center – All Your Integrations In One Place! iPresso integrates with leading CRM systems, social media platforms, messaging services and applications supporting Marketing Automation. Now all of the integrations are easily accessible in a new, refreshed dashboard. The new Integration Center will allow marketers to quickly launch and edit the integrations available in iPresso. The system is currenty integrated with multiple CRM systems, apps, messaging services, and social media platforms. All of those integrations allow marketers to better manage their marketing efforts and collect more data about their customers, which may later be used, for example, in marketing automation scenarios. The new refreshed interface of the Integration Center will make it even easier to set up and launch new integrations. The current integrations available in the system include PrestaShop, Magento, Prosperworks, Zendesk, Livespace, and many more.